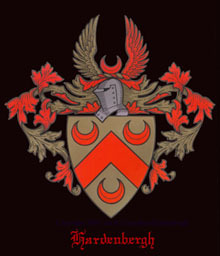 A Web Page for Hardenberghs on the Net. Mission: to provide a focal point for Hardenberghs on the Net. With the final h, it is almost certainly American. The Dutch Hardenbergs dropped it a long time ago! I scanned and linked the first (2) three pages of the Miller Book. They contain speculation about the name and whether we are related to the Castle Hardenbergs. 2016-11-26 Check out this blog post: Hidden Dutch treasures at Rutgers Special Collections featuring the journal of Johannes Gerardus Hardenbergh. Author: Helene Van Rossum. Also note: The New Netherlands Institute that has archives and MAPS!!! 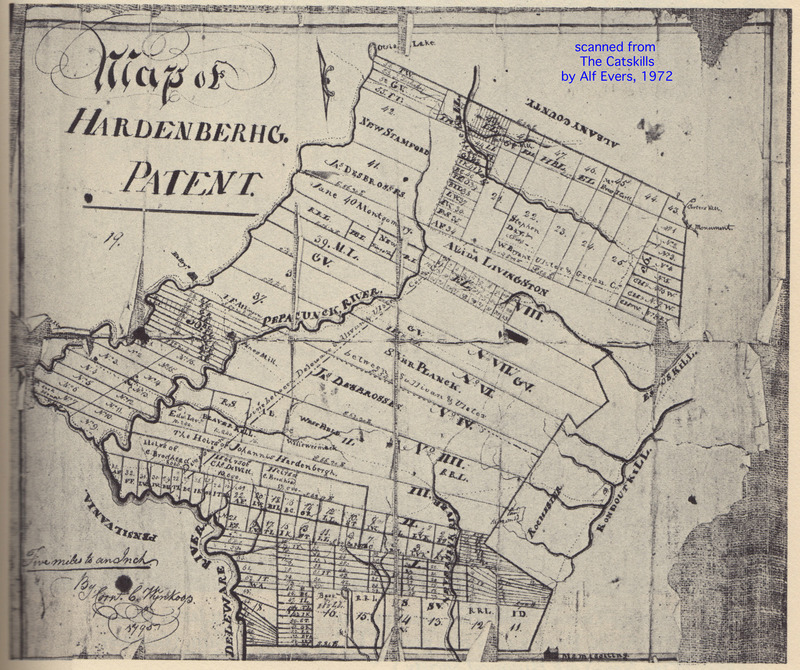 Everyone in Renee Hardenbergh McGrew's Hardenbergh Genealogy Pages are the descendants of Gerrit Jansz Hardenbergh, the person who came to the New World. Renee's pages also have many generation of Hardenbergh. Next step is add my branch of the family to Renee's or some common database. The path currently diverges with the elder Jacob Rutsen Hardenbergh. This will become the core of the genealogy section of this website, with, we hope an ever expanding database of our families. Interested in contributing? 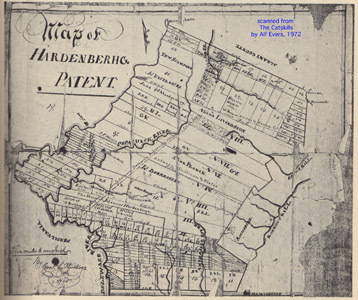 Hardenbergh Patent: In 1708, Johannes Hardenbergh was granted The Great or Hardenbergh Patent consisting of approximately two million acres of land situated in Ulster, Greene, Orange, Sullivan and Delaware Counties, New York. The more one reads about the patent, the more infamous Johannes seems to be. What about the famous Hardenberghs? If you have content that belongs on hardenbergh.org send me eMail . Here is a note about the Hardenbergh Welles connection from Ford Burkhart. Theodore W. Welles's book, Ancestral Tablets, was one of the primary sources used by Myrtle Hardenbergh Miller in creating The Hardenbergh Family, published in 1958. I'd be glad to look you or your ancestors up in it. You can buy the Miller book at various places, one of them is Quintin's Family History Centre. Do you know about anyone on the Information Wanted page? Are you interested an eMail address of yourname@hardenbergh.org? Also, check out Castle Hardenberg in Germany, and closer to home, an old family homestead, Hardenbergh House, a B&B in a historic house in the old stomping grounds on the Hudson. In New York City, there is the The Hardenbergh/Rhinelander Historic District. Famous Hardenbergh's with and without the H.
Jacob Rutsen Hardenbergh, great grandson of Gerrit, founder and first president of Rutgers (originally Queens College) and last Pastor of of New Brunswick to preach in Dutch. See also The Diary of Dina Van Bergh (Jacob's wife). Their house, the Old Dutch Parsonage is an historic site. Henry Janeway Hardenbergh, son of John Pool H., son of Jacob Rutsen H. (b. 1792), son of Jacob Rutsen H. (b 1768). Henry Janeway Hardenbergh a famous architect , designed the Plaza and Waldorf Astoria in NYC, Copley Plaza in Boston, and the Willard & Raliegh hotels in Washington DC, s well as many others. He is the most famous American Hardenbergh. Gerard Rutgers Hardenbergh, 1856-1915 was an artist who's work is still very popular. Novalis (Hardenberg, Georg Philipp Friedrich Freiherr von, 1772-1801) famous author, here's a quote "Love is the final end of the world's history, the Amen of the universe." Karl August Fürst von Hardenberg. (1750-1822) German Statesman credited with bringing Prussia to a constitutional state. Col. Jacob Broadhead Hardenbergh, last war colonel, 20th NYSM. Brought the men home to Albany in 1866.